Disruptive technologies such as mobile, cloud computing and social platforms have placed enormous power into the hands of consumers. Faced with the need to meet rising customer expectations but keep costs in check at the same time, companies around the world are betting heavily on CRM and e-commerce applications. According to a new report from Ovum, these will be the fastest-growing segments of the enterprise applications market between 2013 and 2018. Ovum predicts that the CRM and e-commerce segments will grow at a compound annual rate of about 10% over the specified period. While the focus is on attracting, engaging and retaining customers, business organisations are also keen on innovating, Ovum established. For this reason, the analytics company expects enterprise applications designed to support innovation to be the second fastest-growing segment, with compound annual growth projected at 8%. Examples of such applications include product lifecycle management (PLM) and innovation management platforms. According to Ovum, innovation will be the primary driver of spending in the manufacturing and healthcare industries. These two verticals are expected to invest the largest amounts in enterprise applications during the period under report. Healthcare operators spent $12.2 billion in 2012 and their investment will almost double by 2018, reaching $22.9 billion. In the manufacturing sector, spending is forecast to rise from $14.6 billion in 2012 to $23.9 billion in 2018. From a geographic perspective, the strongest growth will be observed across emerging economies, most notably China, India, Brazil, the Middle East and Africa: Ovum sees the annual increase in these markets at between 13% and 16%. Europe and the US are expected to deliver annual growth of 7% to 8% through to 2018. SMB Tech Tips by Gene Marks: Gene Marks is a small business owner, technology expert, author and columnist. He writes regularly for leading US media outlets such as The New York Times, Forbes, Inc. Magazine and Entrepreneur. He has authored five books on business management and appears regularly on Fox News, Fox Business, MSNBC and CNBC. Gene runs a ten-person CRM and technology consulting firm outside of Philadelphia. Learn more at genemarks.com. Back in the day, when I talked to small business owners like myself, no one knew what CRM (Customer Relationship Management) was. Now, everyone seems pretty familiar with the concept, and the more well-known applications like Salesforce.com, SugarCRM and Batchbook. But the sad fact is that even though many know what CRM is, most still aren’t using CRM systems very well. In fact, of the 600 clients my company serves using various CRM systems, I’d say only 20 percent of them are really doing the right things. And what are the right things? It’s all about three words. 1. Integrate. A CRM system should not be on its own island. It should be talking to other systems — which means that your CRM software should be exchanging data with your accounting system, website and other databases. So when you choose a CRM application, make sure it has links into these other systems. When you view a customer’s record, you not only want to see their activities, notes, emails, pipeline and other CRM data but you also want to know their order history and whether or not there are any outstanding invoices.If you’re a Xero user, then check out the many CRM systems that partner and integrate with Xero. Also, Xero just introduced a new CRM-like feature called Smart Lists that let’s you search your customer data to create highly targeted lists that you can export to a CSV file to use via your email system or export to Constant Contact for targeted email marketing campaigns. 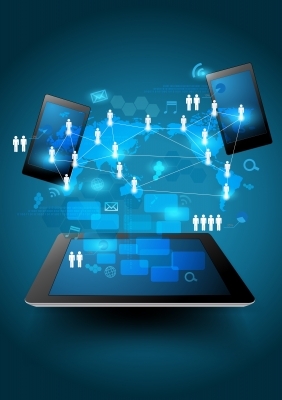 The main point here is to centralize your customer data. Don’t be stuck doing duplicate entry. Don’t fall victim to bad data. Integrate. 2. Report. In the end, your CRM software is really nothing more than a big fat database. Forget the bells, whistles and fireworks. The companies I know who are most successful using CRM systems are getting good, relevant and timely data out of their systems and using that data to run their organizations. You need a pipeline report, showing you potential opportunities and where they stand. You need an activities report, which lists what your sales and service people have scheduled, who they’ve spoken to, who they’re planning to visit. And you need an issues report, where you can be aware of any problems, cases, tickets, calls that need addressing, who’s working on it, how long it’s been a problem and when it will be fixed. These reports should be delivered to you automatically and frequently. You should be relying on them. If you are, then you’re using your CRM well. If you’re not getting good reports from your CRM software, then you’re really not using it at all. 3. Automate. When someone issues a quote, are you getting reminded before it goes overdue and falls through the cracks?If someone signs up for a newsletter, requests a brochure or registers for one of your company’s events — are you getting notified? Are you aware of those customers that haven’t received a single phone call from any sales rep in the past six months? Did you know that, after spending all that money on that trade show in Chicago no leads were distributed and no follow-ups were done with the people that visited your booth? All good CRM software has a little bit of automation. And the great ones have a lot. The CRM companies that partner with Xero all have automation capabilities so that you can make sure that nothing is falling through the cracks and no process is being circumvented. Usually, no programming is involved. The real challenge is figuring out the process. But once you do, that process can be automated in your CRM software so that things run faster, quicker and more productivity. 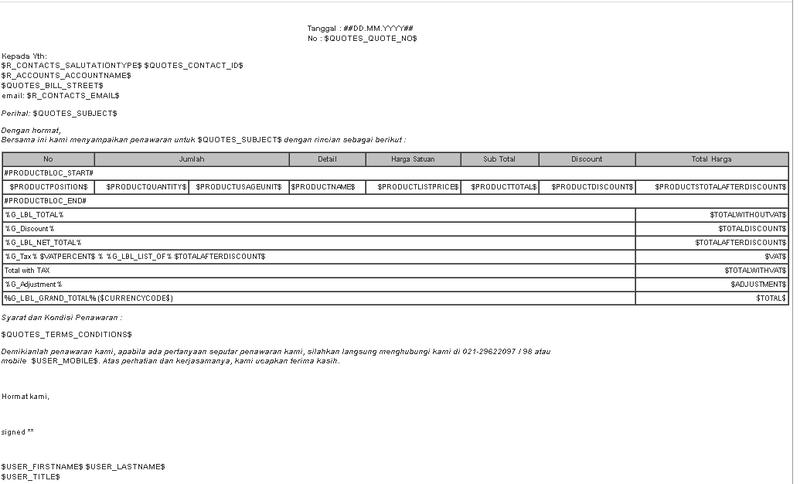 Salah satu fitur yang menarik dari vTigerCRM adalah menghasilkan file output PDF dari Quotation, Sales Order dan Invoice. Hal ini bisa dilakukan dengan menggunakan fitur PDF, dan Edit to PDF. Dan yang menarik lagi, kita bisa melakukan dan membuat custom PDF, dan bahkan bisa menambahkan grafik di dalamnya, semua bisa dilakukan dengan menggunakan PDFMAKER. Kami sendiri pun melakukannya di kantor, dengan menggunakan vTigerCRM yang kami gunakan. Uniknya, ini tanpa programming sedikit pun. Kita bisa membuat custom field di semua form dalam CRM. dan menggunakannya dalam form yang kita buat.